Today I managed about 3 rows of my Trillian scarf before I had to put it down. Ah- I remembered to weigh it today- I’m supposed to knit in pattern until I have 7% of the skein left. At 150 grams in the skein, I should stop at about 12 grams and start the finishing rows. I still have over 60 grams, so I have a ways to go. That left me feeling restless, and sad that my 2 current projects only allow me to knit a couple of rows at a time, so I took a good look at my Ravelry queue and came up with a new project! I’ve been wanting to knit a gift for the Girl’s 2nd grade assistant teacher, who also taught her many classes leading up to her recent baptism. 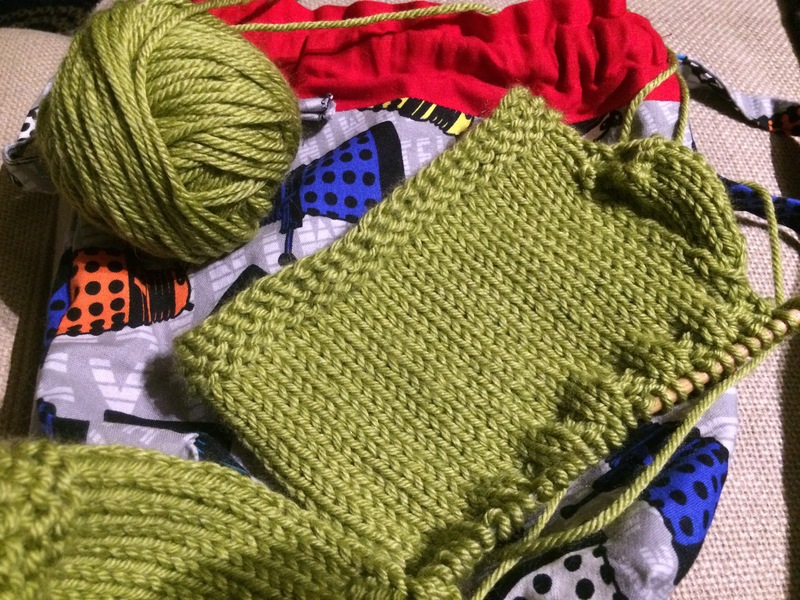 In my queue were the Wabi-sabi mitts, and the Girl chose green yarn because the teacher is from Ireland, and bam! A few hours later and the mitts are half done. They’re knit flat, which is fine because the seaming is minimal, and it’s always fun to look at something in a new way. This is Debbie Bliss Cashmerino Aran, and it’s incredibly soft and nice. I think the teacher will like them, and I’m enjoying knitting them.